• Tabletop micro-centrifuge: Eppendorf Centrifuge, Model # 5415C. 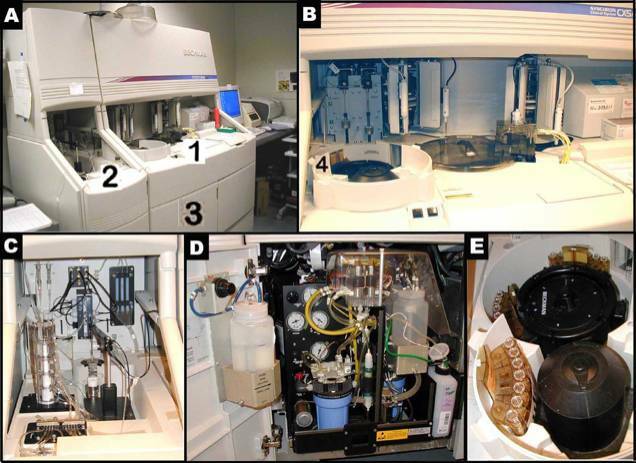 • Automated blood chemistry analyzer: Synchron CX5 Delta (Beckman Coulter, Inc., Fullerton, CA). • A dedicated DOS-based desktop computer controls the programming of this analyzer. • A dedicated printer prints the results as they are measured, and an electronic file is simultaneously transferred to a second, Windows-based computer, which stores the data files. Figure panels A-E illustrate the Beckman Synchron CX5 Delta. Figure B shows a closer look of area 1 in Figure A. Figure C presents a closer look of area 2 in Figure A. Figure D depicts a closer view of area 3, where ancillary reagents are refilled in Figure A. Figure E reveals the content of area 4, where samples are set up in trays for an automated run in Figure B. Sector cups, Figure F (below): 0.5 mL Beckman Coulter MicrotubeTM Tubecup, or polystyrene sample cup (Globe Scientific, Paramus, NJ) for blood chemistry analysis. Diluents for electrolyte samples: Synchron® Control Comprehensive Chemistry Control Plasma Level 1 (Beckman Coulter, Inc., Fullerton, CA) or pooled mouse plasma. Beckman Coulter (Synchron CX®CX5 Systems) MicrotubesTM, 13mmx 100mm tubes for electrolyte analysis. a. A drop of local anesthetic (tetracaine) is applied on the eye before blood is drawn. Approximately 600µL blood, yielding approximately 300 µL of plasma is collected from each mouse via a retro-orbital bleed immediately prior to euthanasia. Extreme care is used to avoid hemolysis. b. Collection of blood is accomplished using red marked (ammonium heparin-coated) microhematocrit tube, into either an Eppendorf tube or BD Microtainer SST (plasma separator tube). c. Samples are allowed to clot at room temperature for 20-30 minutes and not longer than 3 hrs. d. Blood samples are centrifuged at 14,000 rpm for 10 min in plastic tubes only (glass tubes often shatter at this speed). e. The upper layer of the plasma is carefully transferred into a new 1.5mL Eppendorf tube and frozen at -20°C for later analysis. In the process, extreme care is taken to avoid disturbing or pipetting the bottom red cell layer. f. Unless using microtainer tubes, the samples are spun again a second time for 5 min at14,000 RPM to remove residual blood cells that may have been accidentally aspirated (see Figure G below). Samples for Chemistry analysis are run undiluted using no less than 125µL of sera per sector tube.For optimal results, collection into plasma separator microtainers is recommended. Unlike serology, chemistry tests absolutely require samples without red blood cells. After centrifugation, gel in the microtainers separates the plasma from the red blood cells for easier transfer. This also saves time, as no second spin is necessary. g. The plasma is frozen at –200C (or below) and thawed only on the day of analysis. h. Constituents of the blood chemistry panel included Albumin (ALB), Total Protein (TP), Blood Urea Nitrogen (BUN), Total Cholesterol (CHOL), High Density Lipoprotein Cholesterol (HDL), Triglycerides (TG), Free Fatty Acids (FFA), Alanine Aminotransferase, (ALT), Glucose (GLU), Creatine Kinase (CK) and Thyroxine (T4), Calcium (CA), and Phosphorus (P). i. The method used for the measurement of Calcium and Phosphorus is based on colorimetric assay, hence, they are included in the blood chemistry panel. j. Constituents of the plasma electrolyte panel included Sodium (Na), Potassium (K), Chloride (Cl), and Carbon Dioxide (CO2). For Electrolyte analysis, 55 µL of plasma sample is diluted with 55µL of diluent. k. In applying plasma samples to each (disposable) sector cups, extreme care is done to avoid creating bubbles that can compromise the accuracy of the colorimetric analysis. In the event of a bubble formation, a pipette tip or a toothpick is used to burst or dissolve it (see Figure H, red arrow below). l. Final sample volume included the "dead volume" (40 µL) of the machine plus 125 µL for plasma chemistry or 110 µL for plasma electrolytes. m. The Sychron CX5 Delta is operated according to manufacturer's protocol. Additional tips and technical information can be obtained from the manufacturer. Figures I and J show consecutive sector trays identified with bar codes and seven sector cups contained within each tray. Blood plasma chemistry: Albumin (ALB), Total Protein (TP), Blood Urea Nitrogen (BUN), Total Cholesterol (CHOL), High Density Lipoprotein (HDL) direct measurement, Triglycerides (TG), Alanine Aminotransferase (ALT), Free Fatty Acids (FFA), Glucose (GLU), Creatine Kinase (CK) and Thyroxine (T4), Calcium (CA), and Phosphorus (P). Blood plasma electrolytes: Sodium (Na), Potassium (K), Chloride (Cl), and Carbon Dioxide (CO2). CO2 is measured with the electrolytes as it is analyzed at the same time as the electrolytes, but venous CO2 values most likely reflect room air CO2 solubility in the plasma. The average of the diluent analyzer value (run in triplicate) is subtracted from the analyzer value multiplied by two (dilution factor) to obtain the electrolyte values.